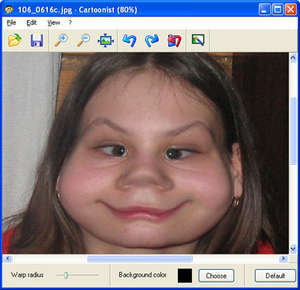 Cartoonist is an image editing tool that lets you add a touch of humor to your digital pictures. This compact and easy-to-use program enables you to create sophisticated caricatures applying warp effects in a matter of minutes. Whether you are a professional designer or a PC novice looking for some fun, make the best use of your creativity or just relieve stress by warping images of your friends and celebrities! For security reasons, you should also check out the Cartoonist download at LO4D.com which includes virus and malware tests. Additional screenshots of this application download may be available, too. Cartoonist has a presence on social networks.